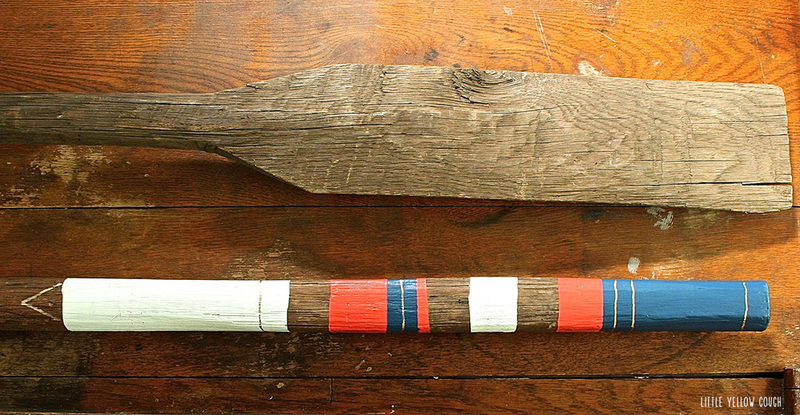 For this project, I found an old set of oars at the Brimfield Antique Show for about $40. They have a great weathered look and we thought that adding a modern striped pattern with a touch of gold would make a nice contrast. I plan on using them as an affordable piece of sculpture in my home. Karen and I are both loving the paint dipped craze right now. (For one of our party invites, we dipped the ends of wooden spoons into paint, which you can see here). As for larger items, we've seen the legs of pretty much every piece of furniture altered by adding paint to the bottoms. This gave us the idea to paint the "legs" of the oars. Technically, I couldn't dip the oars because it was obvious to us fairly quickly that we'd need a whole lot of paint and some ridiculously tall, skinny buckets to actually dip them. So instead, we put the old painter's tape trick to work. The thing is, I've had some rotten luck with taping off edges when I paint. It often seems that the color leaks under the tape or I peel off some of the paint when the tape is removed. (Anyone else feeling my pain?). I thought I'd give it one more try since I really, really wanted to go for this paint dipped look. This time, I used the Frog brand of painter's tape (see our supply list, below). I chose a very light mint, a coral and a nautical blue for the stripes. I was doing a little jig when I pulled off the first piece of tape and saw a perfectly even line of blue. All Hail the Frog Tape Miracle! I used the width of the tape to determine the spaces where the wood would show through. For the times when there were two colors touching (the blue and the coral), I did the coral first, let it dry and then re-taped for the blue. The final touch was some thin gold stripes that I did freehand using a Sharpie paint pen. I'm really happy with the results! Let us know if you've tried anything similar...we'd love to see your photos!